The road to data center efficiency is paved with good intentions…but littered with unintended consequences. In this presentation, Chris Crosby will discuss how the industry-wide drive to increase data center efficiency by data center operators, end users, IT equipment manufacturers and others can ironically lead to major inefficiencies and dysfunction that go directly against the objects of these efforts. Crosby will discuss how high-density server architecture, government regulations, virtualization and other efficiency-minded initiatives are resulting in unexpected challenges and negative results. 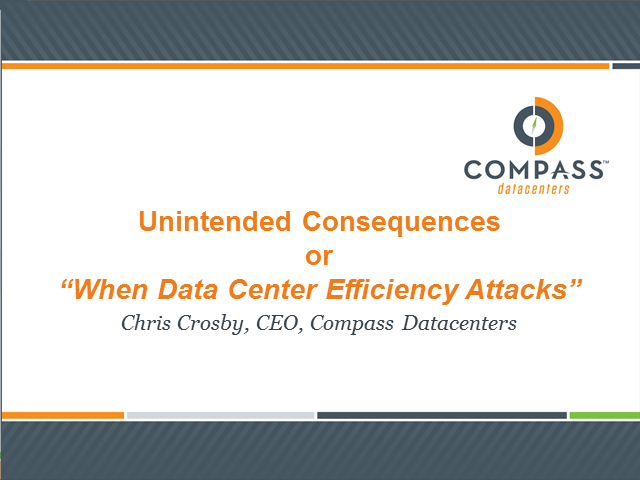 Crosby will also talk through approaches to achieving data center efficiency that avoid these unintended consequences.